In a recent survey about Jersey’s future, the environment was a high priority for people. Despite the Island’s small size, it contains an incredibly diverse range of natural habitats alongside our more built-up areas and many would argue that Jersey’s countryside and coast contribute significantly to our quality of life. One of the many ways the Department of the Environment tries to protect the Island’s natural environment is by identifying some of the most important places for wildlife and protecting them. The Island’s first ecological Sites of Special Interest (SSIs) were designated in 1996 and we now have 19 – mainly in the south and west of Jersey and covering a total of four per cent of Jersey. Noirmont – the sister reserve to Portelet, this headland is very popular and valuable for its ecological and historical wealth. What is a Site of Special Interest? 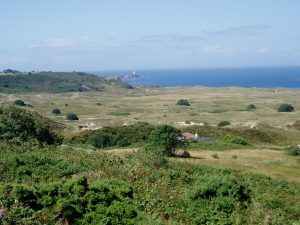 A Site of Special Interest (SSI) in Jersey or a Site of Special Scientific Interest (SSSI) in Great Britain broadly mean the same thing; they are conservation designations placed on sites to protect their special biological or geological features. Some areas, such as the sand dunes of Les Blanches Banques or the heathlands of Les Landes can encompass entire landscapes and are familiar to most Island residents, who visit them for walking and enjoying the wildlife and landscape. Other sites may be much smaller but contain an important population of a specific rare or scarce species or a remnant of a threatened habitat. When selecting an SSI the site needs to meet the Ratcliffe Criteria, 10 intrinsic qualities worthy of protection, scoring on each criteria. These qualities include the fragility of the site, its rarity, position, naturalness and intrinsic appeal. SSIs can be in public or private ownership and under the Planning and Building (Jersey) Law 2002, the Department of the Environment must keep a list of places or buildings of special zoological, botanical, ecological, geological, archaeological, architectural, artistic, historical, scientific or traditional interest. Most people haven’t heard of the blue winged grasshopper, found on our coastal habitats, or may not know we have a Jersey Bank vole unique to our shores. So why is their survival important? Jersey is a signatory to the Convention on Biological Diversity, a treaty with the goal of improving global sustainability. The wildlife found in Jersey is special, as is often the case with many islands. In our case, animals and plants are similar to those found in the UK and to the French Atlantic coast. As a result we are lucky enough to provide a home for species at both the southern and northern limit of their range and as a consequence Jersey’s biological lists differ somewhat from SSIs in the UK. In both a local and national context, protected sites offer people the closest we have to ‘wilderness’ even though they are all found within a managed landscape. SSIs are where nature is able to exist undisturbed and is protected, while still allowing people to enjoy the natural world close up and at first hand. Stepping outside into a semi-natural backdrop strikes a chord with most people and provides a wonderful landscape for people to enjoy and appreciate at their leisure. Planned management tasks will be carried out to improve or maintain the condition of the habitat (by adding structure or species diversity). These include grazing livestock (interestingly different livestock have different grazing results and should be selected to suit a site’s management requirements). In the absence of grazing, mowers may be used, tractor mounted when appropriate, and controlled by hand when working in more fragile environments. The habitat improvement and species conservation work is carried out on a daily basis by a trained ranger team with the valuable support of volunteer groups, Probation and After Care Services and the Social Security Back to Work Scheme. Bringing together a blend of passion, muscle power and know-how, the future of our prized countryside is looking positive. To ensure the ongoing good condition of the SSI, we need to keep monitoring the important site features. These might include species of importance such as various members of the orchid family, agile frogs and any desirable habitat listed in the site’s original designation proposal. The monitoring process highlights any positive or negative trends – for example population numbers or habitat extent, and it will help identify factors which may be altering local conditions. Then the Department of the Environment can establish a maintenance programme or control measures (educational, enforcement or physical management).